Capital of the Persian province of Ardilan, on the road between Bagdad and Hamadan. Benjamin II. 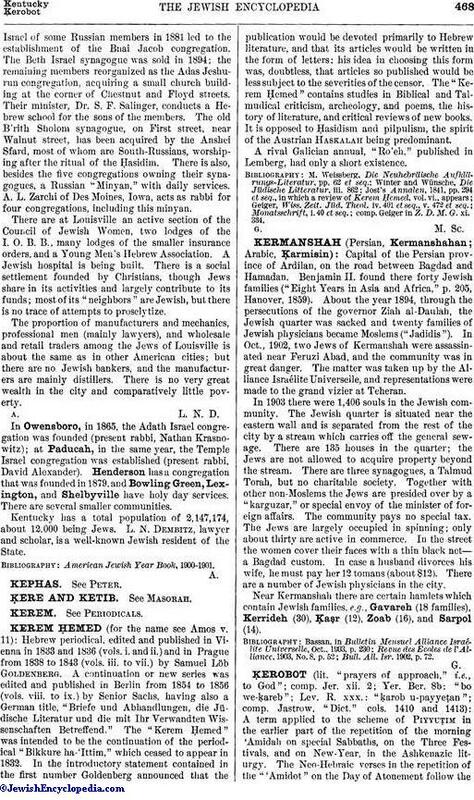 found there forty Jewish families ("Eight Years in Asia and Africa," p. 205, Hanover, 1859). About the year 1894, through the persecutions of the governor Ziah al-Daulah, the Jewish quarter was sacked and twenty families of Jewish physicians became Moslems ("Jadidis"). In Oct., 1902, two Jews of Kermanshah were assassinated near Feruzi Abad, and the community was in great danger. The matter was taken up by the Alliance Israélite Universelle, and representations were made to the grand vizier at Teheran. In 1903 there were 1,406 souls in the Jewish community. The Jewish quarter is situated near the eastern wall and is separated from the rest of the city by a stream which carries off the general sewage. There are 135 houses in the quarter; the Jews are not allowed to acquire property beyond the stream. There are three synagogues, a Talmud Torah, but no charitable society. Together with other non-Moslems the Jews are presided over by a "karguzar," or special envoy of the minister of foreign affairs. The community pays no special tax. The Jews are largely occupied in spinning; only about thirty are active in commerce. In the street the women cover their faces with a thin black net—a Bagdad custom. In case a husband divorces his wife, he must pay her 12 tomans (about $12). There are a number of Jewish physicians in the city. Near Kermanshah there are certain hamlets which contain Jewish families, e.g., Gavareh (18 families), Kerrideh (30), Ḳaṣr (12), Zoab (16), and Sarpol (14). Bull. All. Isr. 1902, p. 72.